During a run initiated by Credit Crash, is the Runner required to reveal the accessed card to the Corp if it is accessed from R&D? The card must be revealed. This effect requires the Corp to act on an element of the card, so it is satisfied by the Corp examining that card. If the Corp prevents the trashing of the first card accessed with Credit Crash, can the Runner still trash that card normally? This is a Criminal card that somehow ended up the color orange. Let me explain. Imp, Wanton Destruction, Scrubber, Edward Kim: Humanity's Hammer, and Whizzard: Master Gamer. These are all orange cards that do one very important thing: they trash stuff. That's only a few of the Anarch options available for doing so too; there's many more. Some of those cards do it outright, and some give you the resources you need to do it. Either way, when they help you destroy something, it is a guaranteed destruction. Credit Crash is not. With Credit Crash, you can't just rush into a server guns blazing and wreck whatever you like, as is often the Anarch way. Unlike the cards mentioned up above, Credit Crash is a bit harder to use, and requires some planning. Some set-up first. It requires you to either have a lockdown on the corps credit pool, or for you to be using Credit Crash to do that exact thing, and have a follow-up strike on the ready. And which faction loves to have their hands in the corp's bank, with cards such as Account Siphon, Forged Activation Orders, and High-Stakes Job, just to name a few? Criminals, that's who. Account Siphon and then use Credit Crash to destroy their SanSan City Grid for free. Or Emergency Shutdown an ice protecting an Eve Campaign, and make the corp choose between re-rezzing that ice to stop you, or having the money to keep their asset alive. There's plenty of possibilities, and Crims are the ones with them most readily at their fingertips. The card is also only one influence, and one credit to use, so splashing a copy or two into a crim deck built to use it is a pretty good deal. Just be careful about using this card in a run on R&D or HQ. Unless you're 100% sure about what you're about to access, you could hit something like a Subliminal Messaging, or Jackson Howard. What a waste. Blood Money is a perplexing pack. Half the cards are meta-shifting, strategy-defining good. And the other half...are things like this. What is this card supposed to do? Well, it lets you trash a card at no cost, even if it's not normally trashable. This is useful for one of two reasons: either you can trash a card that you normally couldn't (like ice or an operation), or you can trash an asset or upgrade for cheaper than it normally would. Except that the corp can stop it by paying the play or rez cost. This is a major flaw. This means that you can't effectively Credit Crash a PAD Campaign, because the corp would gladly spend 2 to keep it alive. Same thing if you hit an Exchange of Information out of HQ, only this time it's free. And that's assuming that you even make it into the server and hit the thing you want. Most things you might want to Crash will be protected by ice. If something isn't in an iced server, then usually it either has a high trash-to-rez ratio (like a PAD Campaign) or the corp doesn't mind if you trash it. As for ice/operations, if they're held in HQ or R&D there's no guarantee you'll hit them anyway, or that the corp won't just keep alive by paying the rez/play cost. The final nail in the coffin for this card is Demolition Run. Do you remember that card? Maybe just barely. No one has played it for ages. It was only ever used for massive Medium glory runs, and only rarely then. 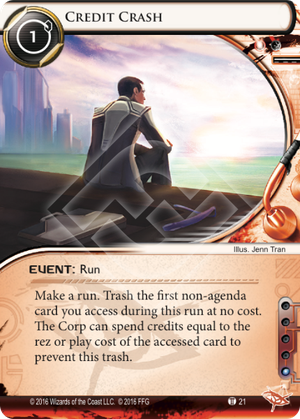 Demo run just didn't have enough impact in enough games to justify its inclusion in most decks. So when Credit Crash is almost a strictly worse card, I struggle to imagine a deck that would want to play it. Yeah, Credit Crash is a credit cheaper and one less influence, but even if it were free on both counts I don't see why it would be worth the card slot. Especially out of Anarch, who already have tools like Imp and Edward Kim for trashing the untrashable, and Whizzard and Scrubber for trashing the trashable. So...yeah. Don't play this one. I appreciate the attempt to tie an effect to the flavor of the cycle, but I wish the mechanics of the card had the same level of attention.